With so many electric car charging stations, you can safely drive anywhere. Once upon a storied time (also known as the 1990s), the idea of widespread electric car charging stations was pretty much inconceivable. Even though companies like Ford and Honda had electric vehicles on the market, each manufacturer had its own type of charger that was incompatible with other vehicles. And lo, a standard for EV electrical connectors was born. Since then, car manufacturers like Tesla and Ford have made huge strides in developing cars that are easily charged at home, and networks like PlugShare and ChargePoint have made it easy to locate charging stations around the country (plus Canada!). In 2009, there were 3,000 public electric car charging stations in the country. But today, there are about 23,000 — and that number will continue to grow. Here’s what powering up looks like today. 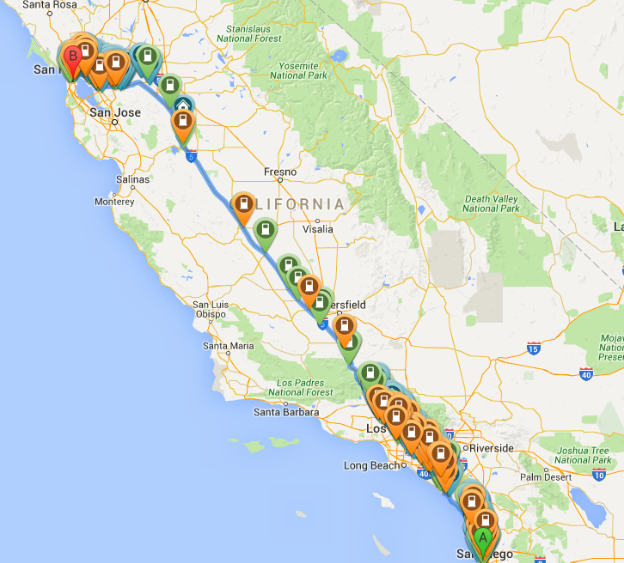 You’re driving from San Diego to San Francisco, and you want to make sure you can take your electric vehicle. Instead of praying to Elon Musk that there are enough charging stations between America’s Finest City and the City by the Bay, you can plan your trip using PlugShare’s map of electric vehicle charging stations across the United States and Canada. The furthest you’d have to travel between charges would be 74.1 miles — the distance between charging stations in the cities of Coalinga and Gustine. The exact range of electric vehicles can vary depending on the manufacturer and whether or not you’re blasting the air conditioner; so, that stretch of road without a charge won’t be a big deal if you’re driving something like a Tesla (over 200 miles on a single charge) or a 2016 Nissan Leaf (over 100 miles). Even if you’re not planning a major electric road trip, networks like PlugShare and ChargePoint are notable because their apps function like Yelp for electric car owners. Users can leave tips about charging locations, coordinate charging at residential chargers, and even receive alerts when a new charging station is installed in their area. ChargePoint states that drivers plug into a ChargePoint station every 4.5 seconds. Through its chargers, drivers have “avoided over 15,200,000 gallons of gas, 48,400,000 kgs of CO2 emissions and 51,000,000 kgs of GHG emissions” — numbers that will continue to grow as electric car charging stations become more ubiquitous. You’re pulling into your driveway after a long day, and you’re ready to turn in for the night with your one true love, Netflix. You step out of your electric car, plug it into your home charger, and forget about it — and when you’re ready for another day the following morning, your car is ready with you. According to Ford, 95% of electric car charging is done at home. After all, home charging is the easiest way to power up your car, particularly since most models allow you to specify the time at which they charge. In San Diego, for instance, it costs just $0.19 per kwh to charge an electric car in the winter between midnight and 5 a.m. (“Super off-peak” time). All electric vehicles are equipped with a standard charging cable that can plug into a wall socket. Generally, as long as your wiring can handle a clothes dryer, it can charge your car. However, it can take up to 15 hours to charge the Nissan Leaf’s battery using a standard wall outlet, which doesn’t always align with busy commuter schedules. Level 2 and Level 3 charging stations can be purchased through companies like ChargePoint, or at stores like Home Depot and Best Buy. The only downside? Not all homes can handle the electrical capacity required of Level 2 chargers, let alone Level 3 — and in those cases, an installation contractor has to give homeowners the final okay. So, final scenario: you’re out running errands in your electric car, and you pull into a mall to treat yourself to some food court lunch because you’re worth it. You realize your electric vehicle’s battery is almost empty, but no worries — it’s a sunny day, and you park your car under a solar canopy specifically for electric cars. A few hours later, you’re ready to head home — and your car is fully charged, as if by magic. Except it isn’t magic: it’s the sun. We can use solar energy to charge tents and cell phones. Naturally, the next step is charging cars. Envision Solar, a company based in San Diego, manufactures electric vehicle charging systems that don’t require any permits or electrical upgrades to install — they’re delivered ready-to-use, and they can be installed almost anywhere. In terms of specs, these solar charging stations deliver up to 150 miles daily, and they can charge up to three electric vehicles at a time. Because of their energy storage systems, they’re capable of charging during a blackout or grid failure, and they’re compact enough to fit inside a standard parking space. These charging stations are 100% emissions free, and they’re outfitted with traction pads that keep them upright in the face of high winds and earthquakes. That’s right — they’re virtually indestructible and good for the planet. We’re excited to see what’s next in the world of electric car charging stations, particularly as simple, accessible options like Envision Solar’s products make it easier for sustainable-minded businesses to install charging stations across the country. Do you have an electric vehicle? What do you like about it? Tell us about it in the comments. "Electric car drivers have avoided over 15,200,000 gallons of gas." Why pay your local energy company each month when there’s a perfectly good nuclear reactor 93 million miles away?